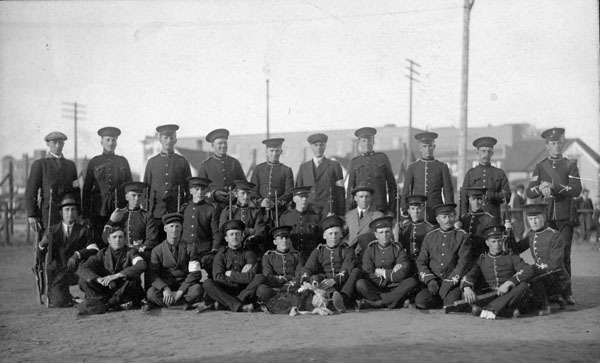 Saskatoon’s first volunteers, 1914. Source: Western Development Museum / Library and Archives Canada / PA-038513. Cultural representations of soldiers during the First World War played a significant role in shaping the image of soldiers both on the homefront and on the frontlines. Upon the outbreak of war in 1914, thousands of young men rushed to volunteer for the Canadian Expeditionary Force. But as the initial influx of enlistments slowed, the Canadian government mounted a propaganda campaign to persuade more men to sign up to fight overseas. Posters used in that campaign played upon a variety of cultural images and assumptions about patriotism, masculinity, valour, and heroism. The image of the soldier in recruitment posters differed somewhat from the kind of images of soldiers that appeared in the cultural products of ordinary soldiers themselves. Rather than the hero, soldiers at the front were drawn to images and stories of anti-heroes. In this module, you will analyze a series of recruitment posters and you will read a journal article about the cultural history of anti-heroes among the Canadian Expeditionary Force. Library and Archives Canada and Canadian War Museum. War Posters, 1914-1918. Cook, Tim. “Anti-heroes of the Canadian Expeditionary Force” Journal of the Canadian Historical Association, 19, no. 1 (2008): 171-193.